A prop-morph expansion pack for Wilmap's G2F Short Skirt. 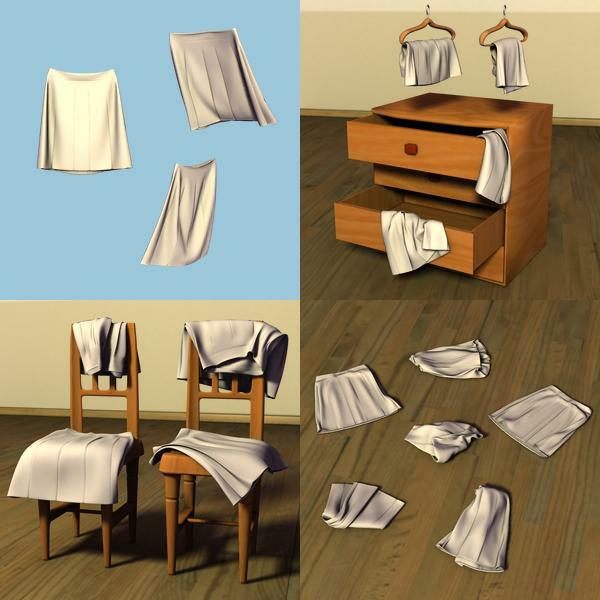 The furniture morphs are for use with Wilmap's furniture (set 2 & 3). Parent the skirt to the furniture prop and apply the corresponding morph. For the bedroom cupboard, parent the skirt to the individual drawers. The items from Wilmap are all freebies on ShareCG. If you don't already have them, go get them now (and don't forget to say 'thank you' to her, she provides us with so many goodies). Tip : the morphs will probably look better if you set smoothing to 'generic' instead of 'base shape matching'. excellent morphs, thank you ^_^ ! Fujiko (2 years ago) Inappropriate? or chests, well not at our place any how !! lol. Thanks a lot for sharing your talent! BlackFeather1973 (5 years ago) Inappropriate? @Fredoragnar : the SuperTee is part of SickleYield's "Sickle Classics Genesis: Tops 01", for sale at Renderosity. Fredoragnar (5 years ago) Inappropriate? For the same with Super Tee from SickleYeld, I don't find this one?? Where is Super Tee??? I've used this in a render, and it works beautifully. I've given it 5 stars. Thanks again! @drawingkev : the skirt is a freebie from Wilmap here on ShareCG, the link is in the description. drawingkev (5 years ago) Inappropriate? this is cool. I don't have the G2F short skirt and found it did not work with other clothing. I would really like to see something like this for G2M. does anyone know if there is something? Added a link in the description. Catweazle (5 years ago) Inappropriate? ok ... and where can i find the shirt? Google doesn't know it. dlsherrill (5 years ago) Inappropriate? I'll second the request for a complete set. Thanks. And thank you for making all the freebies. Wilmap (5 years ago) Inappropriate? Brilliant idea. Thank you for doing these. chimaera (5 years ago) Inappropriate? Wonderful! First Sickle's Tee, and now Wilmap's skirt! Thank you so much! sassanik (5 years ago) Inappropriate? An awesome idea! Thanks for making it! This is really awesome thank you!